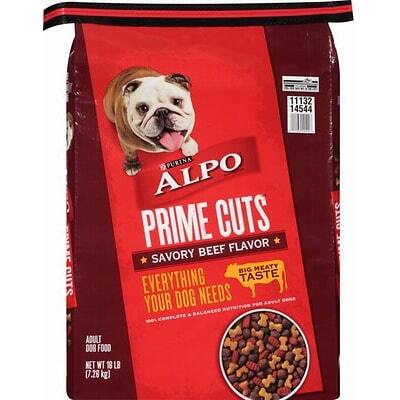 ALPO Prime Cuts with Lamb & Rice in Gravy is a lower quality dog food at a low price. This product has 5 controversial ingredients, which includes artificial colors. It has well-balanced amounts of protein, fat and carbs with meats and fats that are of a mixed quality. 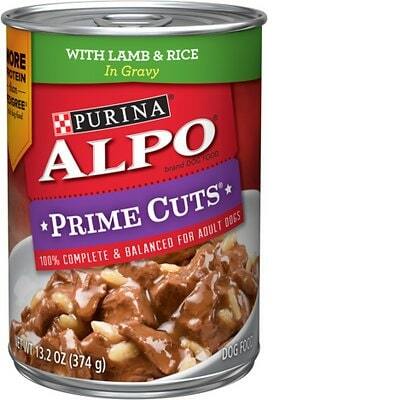 Nestlé Purina, which owns the ALPO brand, has more than the average number of recalls. But on a good note, they were overall pretty transparent when answering our questions. This product has an above average amount of calories for wet food. It’s important to understand how many calories you are feeding to prevent under or overfeeding. Based on your dog's current weight and activity level you may want to feed more or less than the recommended amount. Water sufficient for processing, poultry, liver, wheat gluten, lamb, meat by-products, rice, soy flour, corn starch-modified, MINERALS [potassium chloride, zinc sulfate, ferrous sulfate, Copper sulfate, manganese sulfate, potassium iodide, Sodium Selenite], tricalcium phosphate, added color, choline chloride, VITAMINS [Vitamin E supplement, niacin (Vitamin B-3), thiamine mononitrate (Vitamin B-1), calcium pantothenate (Vitamin B-5), pyridoxine hydrochloride (Vitamin B-6), Vitamin B-12 supplement, riboflavin supplement (Vitamin B-2), Vitamin A supplement, folic acid (Vitamin B-9), Vitamin D-3 supplement, biotin (Vitamin B-7)]. The average dog food we reviewed has 39 total ingredients, with 1 controversial ingredient. This product has 5 total controversial ingredients and 3 of them are found in the first five ingredients. This is concerning because the first 5 ingredients make up most of the product. While poultry is generally nutritious, this ingredient doesn't identify the species it comes from making it questionable and intransparent. This includes the potential that rancid, dead, dying, disabled or diseased meat sources could have been used. For that reason we do not consider this a high-quality ingredient. Raw meat contains about 75% water which is cooked off during the making of dog food. This leaves only a fraction of the protein content in the final product's weight. We recommend looking for dog foods that also include meat meals in the first five ingredients (pre-cooked meat powder that contains four times the amount of protein). Wheat gluten is the main protein in wheat and made by washing out the starch from the grain. Wheat is a grass and cereal grain often used in dog food. It provides protein, dietary fiber, manganese, phosphorus, niacin, B vitamins and minerals. Some dogs may develop wheat allergies, though they are a lot less common than allergies to beef, dairy and soy. The jury is still out on whether wheat is a high-quality dog food ingredient so please consult your vet if you suspect your dog may be allergic or has food sensitivities. Grain-alternatives like potatoes, peas and legumes may be linked to canine heart disease (it's too early to say this conclusively), so keep that in mind when buying foods without wheat and other grains. While poultry meats are generally healthy for dogs, this ingredient doesn't identify the species it comes from making it questionable and intransparent. This includes the potential that rancid, dead, dying, disabled or diseased meat sources could have been used. For these reasons, we do not consider this a high-quality ingredient. Wheat gluten is the main protein in wheat and made by washing out the starch from the grain. Wheat is a grass and cereal grain often used in dog food. It provides protein, dietary fiber, manganese, phosphorus, niacin, B vitamins and minerals. Some dogs may develop wheat allergies, though they are a lot less common than allergies to beef, dairy and soy. The jury is still out on whether wheat is a high-quality dog food ingredient so please consult your vet if you suspect your dog may be allergic or has food sensitivities. Wheat is not generally considered a controversial ingredient, but is controversial when it is used in the top five ingredients (which make up about 80% of the food's weight) where a named meat or lean protein would be more nutritious. 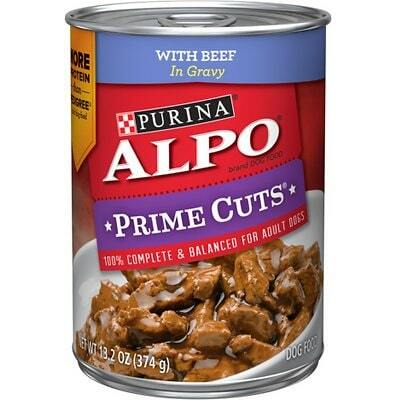 ALPO Prime Cuts with Lamb & Rice in Gravy Canned Dog Food is manufactured in the United States, that’s great. The meat quality in this food is split between high and low, here’s why: ALPO Prime Cuts with Lamb includes clearly identified meat sources like Lamb, that’s fantastic. But it also includes ingredients that don’t show you the animal they come from, namely Poultry, Liver, and Meat By-Products. All three of them are intransparent and their quality therefore questionable. No added oils means that part of the fat in this dog food comes primarily from the meats. Since they are of mixed quality, the fat questionable, too. ALPO Prime Cuts with Lamb & Rice has no artificial preservatives, excellent.It’s good to know that ‍not all artificial preservatives are bad. That’s because they serve an important purpose, which is to prevent food from spoiling. However, we consider 11 artificial preservatives controversial because of their potential link to cancer and other serious health conditions. 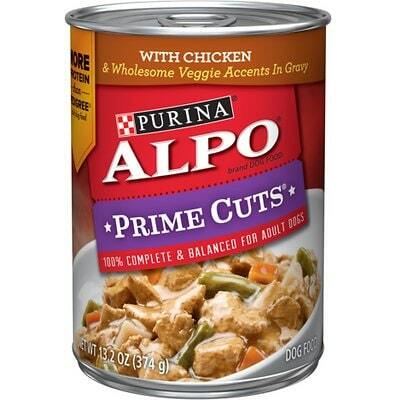 While ALPO Prime Cuts does well on preservatives, it has Added Color as an ingredient, which is an artificial color. No artificial flavors are used to make this food, that’s great.